The vast amount of choices can get a bit bewildering though. London districts are like a series of villages, many with their own distinct food scene. Googling is not much help as the top sites are full of paid-for links and very overwhelming; you don’t really get the inside story. Food trucks, stalls and markets are popping up all over London. I’ve tasted my way through quite a few of them at Food Blogger Connect in 2012 and 2013 and found some of the most delicious and exciting food you’ll eat in the capital. 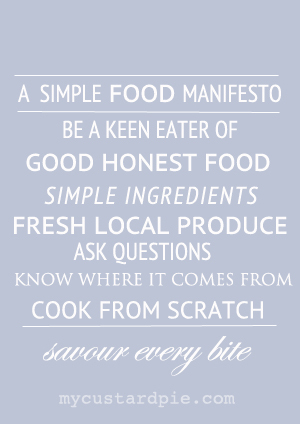 The focus on great quality ingredients is what sets these small vendors apart. They are all a bit mad and creativity doesn’t just extend to their food, but their appearance and presentation as well. I’ve eaten masses of tasty morsels from burgers made with offal (Tongue n Cheek) to freshly fried churros and food from Mauritius, Brazil, Russia and Jamaica to name a few. My very favourite has to be Belle of Bell & Brisket who as well as thrusting a meltingly, savoury, roll of home-cured salt beef into my hand (I can still taste those beefy juices as they dripped down my chin), she also tempted me to try a pickled egg for the very first time. Runners up are Funky Chicken – for the van, name and banter alone, Yasmin of Lovedesh – who set up a tripod and cauldron over a wood fire on a pavement in Battersea to cook a Bangladeshi curry from scratch, and a panini from Gurmetti. Yes an Italian sandwich can be that memorable. Jeanne recommends South African Grant Hawthorne’s African Volcano stall at Maltby Street Market for a variety of peri peri-infused dishes like chicken prego rolls on homemade Portuguese bread, slow-roasted pulled pork on a peri peri bap and giant flame-grilled tiger prawns. Rachel rates The Wild Game Co., Sporeboys, Kimchi Cult, The Rib Man and the irresistible Yum Bun. Urvashi’s tips include the Real Food Market on Southbank, Kerb at Kings Cross (see below) and a bit off the beaten track for Indian food would be a wander along Southall High Street for brilliant take-aways. Kerb – a directory of street traders and events. Worth browsing the traders list for the witty names alone. Street Feast – regular street food night markets (mainly in East London). London Street Foodie – a blog written by the Food Editor of the London Evening Standard which tracks down the best of London’s street food. Street food carts and stalls are often a big part of markets like Exmouth Market for instance. For more market info head to my post about Borough. In many countries the best food is eaten in people’s homes – and why should London be any different? One of the pioneers of the underground restaurant scene in the capital was Kerstin Rodgers aka Ms Marmite Lover. My dates in the UK have yet to coincide with one of her legendary events but I’ve attended them vicariously via her blog and book. The themes are wildly imaginative with food to match. Check out the Maggie handbag biscuits she made for a Thatcher tea (she’s a staunch socialist) and stuffed tulips for a Midsummer night’s dream dinner. My friend May rustles up authentic Malaysian food and you can even have supper in a wine shop (sounds pretty good to me). Find a supper club has an amazing list of around 100 supper clubs in London (plus lists for the rest of the UK and the world). It’s run on the Ning platform so you have to register to use the site but well worth it. London pop-ups has a shorter list of supper clubs in London with good descriptions. Edible experiences is another good lexicon of supper clubs and pop-ups. The London Foodie (as above) reviews quite a list of supper clubs here. Seeing a show in the West End is high on most people’s London to do list. And don’t worry if you just pitch up around the area between Covent Garden and Leicester Square where the streets are a buzz with restaurants and, especially compared with Dubai, the prices are reasonable. My teen and I hung out in Old Compton street which was vibrant on a warm summer’s evening and popped into Made in Italy for a wood-fired pizza before seeing Once (the food was far better than the show). However, if you’re in the know and plan ahead there are really superb places to go. “10 cases is excellent, I’ve also been to Mishkins deli which is pretty good fun.” So says Kat – both have shot to the top of my must try list. Terroirs Wine Bar – Anthony, Jeff and Rachel all recommended this wine bar that focuses on seasonal produce and homemade charcuterie, as well as wine of course. Sounds right up my street. Fiona advises, “the main thing to remember is that some REALLY good restaurants do pre-theatre deals. She went to Hix Soho and had an excellent meal where the set menu was around £20 a head. But, the flip to that is that a lot of places don’t offer reservations. Small chains can deliver good value, as Jeanne says, “The Med Kitchen (on Old Compton Street) is cheap and no nonsense. My favourite for good value is Cote – a chain of French brasseries that does good, traditional French.” Both do good value pre- and post-theatre menus. Rachel’s choices are Gordon’s Wine Bar – the oldest wine bar in London with some reassuringly down to earth pub grub and decent wine list; Dishoom (Covent Garden branch) – a Bombay Cafe that I’m now itching to visit; Brasserie Zedel – a Parisian-style brasserie with a historic Art Deco interior, serving a la carte and prix fixe French menus; and Quo Vadis, a legendary restaurant and club from the 1920’s, now serving modern British food and a daily menu (available on line) with Chef Jeremy Lee in charge of the kitchen. A lovely restaurant selling South Indian food called Woodlands in Piccadilly is Urvashi’s choice. Despite the myriad coffee bars, afternoon tea is a British ritual that shows no signs of dying out and thank goodness for that. Starting with traditional favourites, Fortum & Mason is meant to be super (thanks Rachel) and if it’s good enough for HM the Queen to reopen it… . Worth also noting if travelling by Eurostar that Fortnums have opened a tea salon in St Pancras railway station. The Dorchester and The Ritz (set in the beautiful Palm Court tea salon) are both on Kat’s list and the latter is first choice of Ant’s other half. Kat also recommends Sketch – very quirky, Alice-in-Wonderland-like surroundings and The Orangery in Kensington Gardens (more Royal connections) which also gets Regula’s vote. Across the road from Kensington Palace is the Milestone Hotel which serves another sumptuous tea fit for Royalty (and Jeanne); Queen Victoria hosted her tea receptions here. Urvashi chooses The Langham for a traditional and a classic afternoon tea, St Martins hotel in Covent Garden is more modern and quirky, Mandarin Oriental is again classic but modern, The Pudding Parlour at the Athenaeum Hotel in Mayfair is a stunning ‘must visit’, and Laduree in Harrods for some lovely French classics. You could be lucky enough to time your visit when Rachel’s friends, Milli and Victoria put on their “wonderful – if a little sporadic – afternoon tea pop ups overlooking the river”. There are a few more tea suggestions from Ant’s friend here. Street performer. He hasn’t been drinking. Moving onto to something a little stronger, there are a few places I’d like to investigate. Vinopolis is a ‘wine attraction’ not far from Borough Market on the South Bank. You can book guided wine tasting every day but some of their special tasting events sound intriguing. As a devotee of ‘Mother’s ruin’ I’ve watched the re-emergence of gin as a trendy drink in the UK from afar, and tried to sample some of the new exciting gins from small distillers. The Ginstitute sounds utterly beguiling. And I’ve wanted to take a cocktail masterclass at Rules (the oldest restaurant in London) ever since I read this. Who’s coming with me? Rachel recommends Sager & Wilde and Anthony thinks that it is just the most amazing wine bar in London (read his review), enjoys cocktails at Charlotte Street Hotel, and Gordon’s Wine Bar gets another mention for tradition. Kat’s list is eclectic and intriguing: Drakes Tabanco – is dedicated to serving sherry from the barrel and other wines of Jerez; Bar Pepito is another sherry bar dedicated to the food and drink of Andalucia; Berners Tavern – highlights are a beautiful setting, the chance to play pool in the bar afterwards and an interesting cocktail that contained pickle juice! ; New Street Wine Shop – a wine shop with expert sommeliers, many tasting events and where you can also enjoy some cheese and charcuterie; Planet of the Grapes sounds like the perfect way to enjoy good wine out of the house. They stock over 450 wines, plus wines by the glass. You add a flat £10 fee to any bottle regardless of the retail price to drink it in the bar; 28-50 – all three venues of this wine workshop and kitchen sound like tremendous fun; Charlottes in Chiswick – which I notice holds a regular gin school; and El Camion – Mexican restaurant and bar where they do a lot of good things with tequila. I’ve sipped a cocktail with Jeanne at 101 here in Dubai, but in London she favours Harry Gordon’s Bar in Selfridges and Ember Yard in Berwick Street. With an open fire crackling in the grate and a bartender fixing your favourite drink it feels like private residence of a most beloved, eccentric and indulgent great aunt – we call her Wilhelmina. I couldn’t resist quoting this from the website of Zetter Town House. Everything about it sounds exquisite. And while I’m quoting, Bar Nightjar says of itself ‘a hidden slice of old-school glamour on the fringes of Shoreditch’. Both these gems recommended by Rachel. For traditional London pubs, she likes The Royal Oak and The Carpenter’s Arms (both local to her in E2) and Urvashi also thinks her local the King’s Head in Winchmore Hill is brilliant. #1 Honest Burger – Soho – go to the restaurant, they book you in on iPad and call you when your table us ready. Burgers are sublime – cooked to perfection, great buns and chips. Beetroot coleslaw also superb. #2 Patty & Bun – be prepared to queue for 30 mins but you won’t be disappointed. As well as fine burgers, the confit chicken wings are awesome. #3 Meat Liquor – be prepared to queue again. Burgers very good but the star of the show are the deep fried onion rings and deep fried pickles. This place is very dark and just a bit too cool for school! 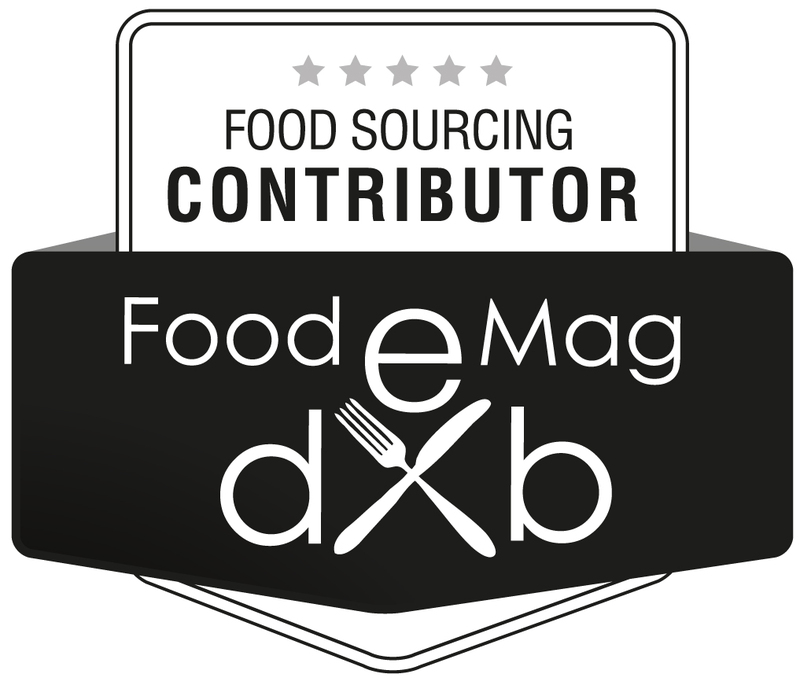 Personally I’ve followed the foodie antics of someone who was completely ahead of the game – Daniel from Young and Foodish. If there is even a hint that you might visit London, sign up now to receive news of his next Burger Monday or Spag Wednesday event. Anthony: The Tapa Room is my go-to place. They don’t take bookings but Peter Gordon’s fusion food is the way cuisines should be crossed. Plus an amazing all New Zealand wine list. Kat: Berners Tavern (as above), Pied a Terre (Michelin Star restaurant in Charlotte street) Duck & Waffle (the highest restaurant in London) Roka (contemporary Japanese robatayaki cuisine) and The Ledbury (two Michelin stars). Jeanne: My fave best value lunch in London by a country mile is Club Gascon in Smithfield – £25 for 3 courses of uttter French gorgeousness (love the plating and the crockery! ); and as you know I am a huge fan of Vinoteca Farringdon (for obvious reasons!) Editor’s note: the obvious reason is because she met me for lunch there and I absolutely loved it too. Rachel: Maltby Street over Borough Market. Crockery from Anthropologie. Check out the Hansen & Lydersen salmon smokery. Try to infiltrate The Food Room and Library in Eton Square. Food at 52 for great cooking classes. Early morning trips to Billingsgate are always worth the effort – if only for the bacon & salmon sandwiches. Bagels on Brick Lane, and curry at Tayyabs. Support young cooks with lunch in the Escoffier Room at Westminster Kingsway college – dreadful service, but seven course taster menu for £25! Zucca (really good Italian food, I had a lovely meal there); Polpo small plates; Bocca Di Lupo my fav Italian, also has a gelato bar; Bone Daddies Ramen Bar; Ceviche Peruvian Kitchen (very nice); St John for nose to tail cooking. Urvashi: I love Sushi Samba in the Heron Tower in Liverpool street – just amazing food and lovely atmosphere inside and outside on the terrace plus great views over London; Dishoom – homely for me when I want a quick spicy nibble at any time of day, outside London in Finchley is Two Brothers fish restaurant which is a must visit in the area, also Cafe Japan in Golders Green is awesome for proper Japanese food and ambience of an izakaya. Sakonis in Wembley is a must-visit vegetarian eatery which is very basic and very budget; the Swaminarayan Mandir (temple) in Neasden is a wonderful sight to go and see but the veggie restaurant there is pretty amazing too. The Hare Krishna restaurant Govinda’s on Soho Street is a top budget veggie eaterie too and Taboon in Golders Green does the best falafel in the world! Fiona: I might add in a ‘lunch’ category – I gather that London is unique in great lunch deals (I went to L’atelier de Joel Robuchon which is one example and the manager there told me that the special lunch menu is only on offer in London) – here’s a little article I did. Rachel agrees: Lunch menus are the key to trying great food at decent prices, for example The Ledbury, Dabbous and Clove. * I noticed that Pied a Terre lunch is 2 courses for £27.50 – which they claim is the best value Michelin star menu in London. The first thing I recommend to visitors to Dubai is Frying Pan Food Adventure, so why not try a food tour in London? Eating London Food Tours sounds just the thing, reviewed here (enthusiastically) by Bintu. 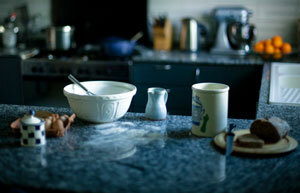 Jeanne’s favourite recent foodie experience in London HAS to be Aveqia’s cooking classes and meals. Rachel has never done one as she prefers exploring by herself but did point me in the direction of a fascinating site called Darling Collective full of all sorts of experiences, which offers a foraging walk in several London Parks as well as supper clubs, wine tasting, cocktail making and cookery classes (also see Food in 52). I’d love to do a tea tasting with these people too; Postcard Teas specialise in fine teas from small farms. Although a traditional restaurant experience, the concept behind both Fifteen and The Brigade is altruistic, offering disadvantaged and vulnerable people catering apprenticeships, giving them tools for a brighter future. I can vouch for a nice atmosphere and great cocktails at Fifteen and there’s a review of Brigade by Rachel here. So apart from a half decent sandwich at Pret, is it possible to enjoy a good meal at one of the many chains of restaurants that are dotted around London? Family friendly Leon (described as serving ‘naturally fast food) and Chiquito – a Mexican Bar and Grill – are the two new ones that stand out for Fiona, while Kat mentions Barbecoa (not a chain so much as part of the Jamie Oliver empire). Rachel rates Hawksmoor (steakhouse) Yalla Yalla (Beirut street food) and Frae (frozen yoghurt) and adds “Not so much a chain – but all the Renaissance pubs are lovely, and all the Russell Norman joints are generally fun (Polpo, Mishkins, Spuntino, also am a big fan of Brawn/Terroirs/Soif which are all run by the same people – as I think are Salt Yard/Opera Tavern. Urvashi likes Pho for Vietnamese, Wahaca for Mexican, The Real Greek for Greek and Spaghetti House for Italian. When seeing the sights of London, it’s so important to know where you can revive yourself at regular intervals. My personal choice is for a good cup of tea and a bowl of soup is in the basement of the National Portrait Gallery – so handy for Trafalgar Square. I also enjoyed the casual, relaxing atmosphere of Timberyard (the Old Street branch) which is very wifi and lap-top friendly. Fiona says there are good cafes in or near most tourist hot spots now. Benugo is one example and Peyton and Byrne another; both offer really good ‘British’ food with a twist, in major galleries, museums and attractions. 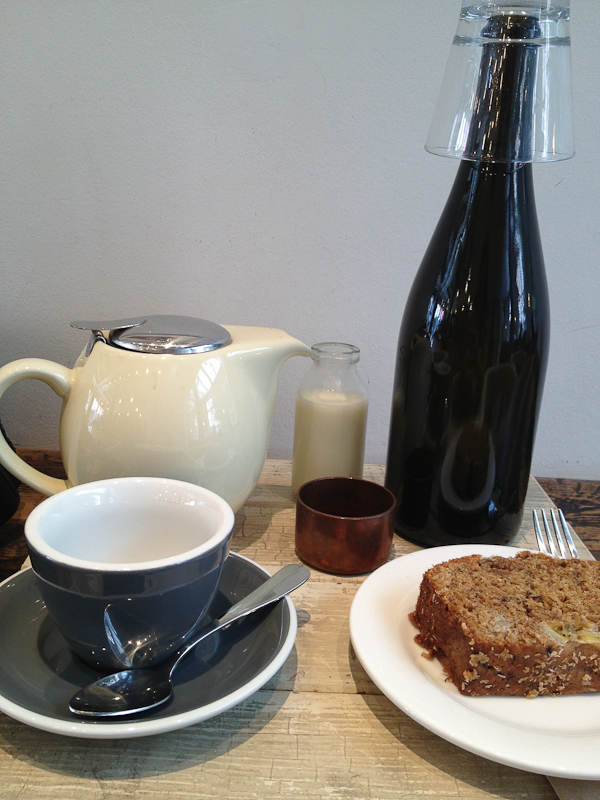 For breakfast, if in need of a really good bacon sandwich, go to The English Restaurant in Spitalfields – thanks Kat. Whereas Jeanne finds it hard to resist the bowls of hot chocolate at Le Pain Quotidian and Regula votes for the Breakfast Club. I can’t believe we’ve got this far without mentioning Ottolenghi – but it’s on Rachel’s cafe recommendations along with The Modern Pantry, Caravan, Climpson & Sons, Monmouth, and Rochelle Canteen. One day Urvashi’s Botanical Garden Cafe will be on this list but for now I she recommends Lock 7 Cycle Cafe on Regent’s Canal (and also Caravan). Beginning with the famous shops, Harrods Food Halls and Fortnum & Mason are worth going just to ogle at the extravagant displays and Aladdin’s caves of culinary delights. Selfridges Food Hall is also worth a visit and Urvashi reckons the prices for some things (e.g. truffles) are very competitive. Neal’s Yard Dairy, La Fromagerie (read more about founder Patricia here) and Ginger Pig butcher made nearly everyone’s list – the latter two have branches in Moxon Street just off Marylebone High Street, a little food hub in itself. Rachel recommends The Whisky Exchange which gives me another reason to visit Vinopolis (it’s inside), also Books for Cooks (legendary book shop) The Japan Centre (for Japanese ingredients) and Turner & George Meat Merchants. Visit Wembley and Southall for Indian grocers says Urvashi, and Atari Ya in Finchley, Golders Green and Acton for Japanese groceries. Markets are a must and I’d recommend Borough Market for the hustle and bustle and the restaurants that surround it. London residents have started to favour other markets as less expensive and not crammed with tourists – Broadway Market, Maltby Street Market, Spitalfields, Whitecross Street and Exmouth Market rank highly. Brockley Market gets a mention for nice villagey weekend market. For more market links visit my Borough post. Some areas have become food destinations such as Northcote Road in Battersea, there’s masses to discover in East London (as Rachel has shown), also written about here by my glamorous friend Amanda. The area around Farringdon Road is well worth exploring, including the aforementioned Vinoteca, St John and more such as The Quality Chop House. Urvashi’s found Bermondsey High street is pretty cool to walk up and down for little cafes and two Jose Pizarro places, and Dean and Wardour street for the same reason with Gail’s Bakery, The Hummingbird Bakery, Paul A. Young chocolate shop and Princi on same road you are in cake and choc lane! Fiona Beckett delights in East Dulwich and for everything food-related about Peckham there is only one source worth visiting. I downloaded a couple of apps but there weren’t much help so would love to know if anyone has found a good one. If you are into burgers and pizza the Young and Foodish app looks useful although I haven’t tried it. This is My Kingdom has a nice archive of good places to go in London too. A massive thank you to these lovely people. Consider your brains well and truly picked. Anthony Davies Confessions of a Wine Geek, Fiona Maclean London Unattached, Jeanne Horak-Druiff Cooksister, Jeff Burrows FoodWineClick, Kat Wiggins The Wine Kat, Rachel Smith The Food I Eat, Regula Ysewijn Miss Foodwise and Urvashi Roe The Botanical Baker. Please do go and visit their blogs for even more great info on eating and drinking. Of course we must have left something out. 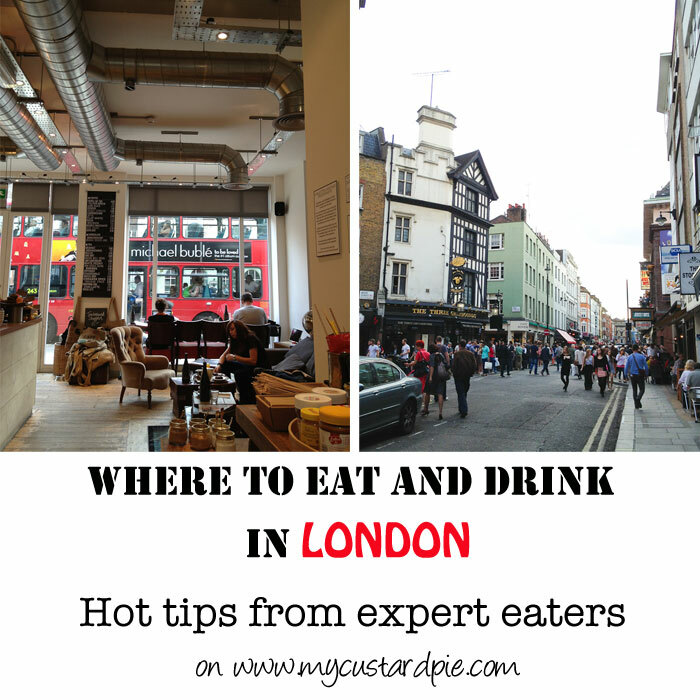 What’s your favourite place to eat or drink in London? 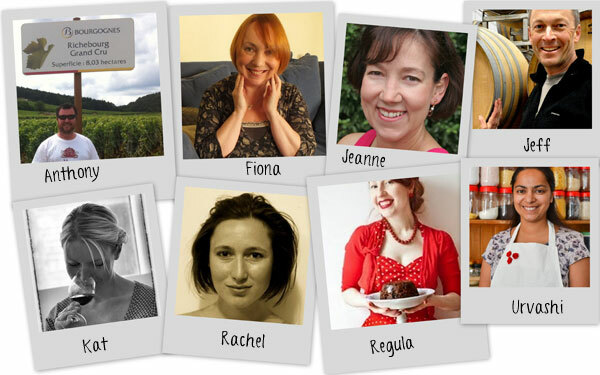 Deeply flattered to be featured alongside so many great bloggers. This is an absolute epic of a post – very, very useful though to have all these recommendations in one place. Lots of tips and places to add to my “to go” list. 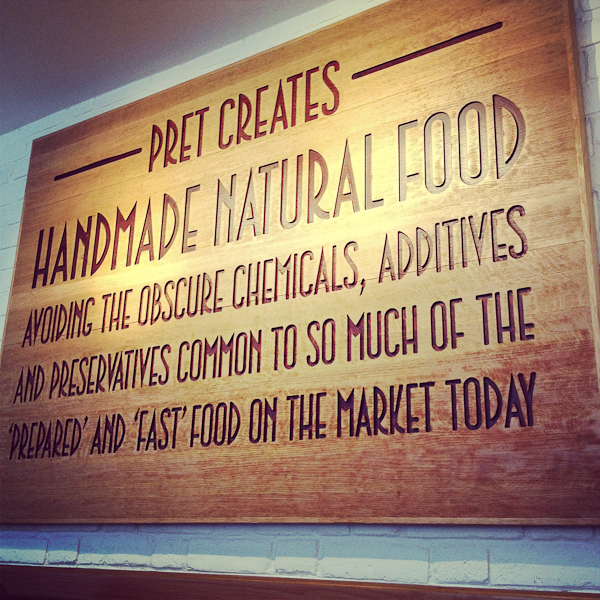 “Just get a sandwich from Pret”…honestly..!!! So much food, so little time eh Rosa? Reblogged this on Your Home with Karie Engels. Phew! As a Londoner, there’s loads here I didn’t know about and some good addresses to check out next visit. I can thoroughly recommend `Pied a Terre – I was wandering round Fitzrovia some time back and just lucked on the place. For a one-star, it’s remarkably unfussy and the food is exceptional – if you’re a cheese addict like me then the cheese selection will have you whimpering with delight. Good, solid wine list also. You’ve tempted me with the cheese description alone Dave. Fantastic amount of really useful info. It’s always good to have recommendations and new places to try out. Thanks so much. Eeek! Am heading to London in June (fingers crossed!) so this is just what I needed for the trip – fab write up, per usual. Brilliant post. Makes me want to go back and visit London. When I saw the title of your post I thought you were brave for attempting it! I love the variety of places and experiences you’ve included. Great post and so many suggestions – can’t wait to try some of these out next time we are in London! Thanks beatingthetrack, Abs, Mandy and Longhorns and Camels – always appreciate your comments. Hope you find this useful. Wow! reading this has reminded me of so many other places I need to visit or revisit! It was a pleasure coming up with some recommendations and thank you so much for including them – on the Burger front I’ve now also been to Five Guys and the burgers are absolutely stonking – you can’t get a glass of wine but the Coke machine is worth a 15 minute queue alone! Great article! You’re going to have to elaborate why queuing for a Coke machine is a good idea!! Thanks again for all your suggestions – fantastic. About 12 different varieties of Coke, Sprite and Fanta… go back as many times as you want, I felt like a 10 year old again! What a great compendium for the next time I find myself in London. Thanks for including my 1 find from a previous trip – Terroirs! How long did it take you to put this together Sally – what an amazing post! We go to London fairly regularly and have not even scraped the surface of your list. I will be keeping this for future reference and starting to work my way through it asap – thank you so much. Ah yes – quite a bit of time – but my source material was solid gold. Love to hear what you think when you visit them. I think the only thing I would add are some of the great places that have fallen out of the spotlight but still produce great for year after year, like Andrew Edmunds in Soho and Sally Clarke in Notting Hill. Too true Dave. Easy to be taken up by the new. Blimey that’s a bloody spiffing round up! I’ve found some nice places that I haven’t been to. Will have new favourites next time I see you for sure! Your perspective on London is brilliant Urvashi – hope you’ll let me pick your brains again. Ruddy fabulous post, and so timely as we are heading down from Edinburgh soon for a big birthday weekend. I will pop your post on my desktop and use it as a handy reference when we get closer to traveling. Your line-up of correspondents did you proud. Great piece, and very interesting; a meander through London with experts. We have Gymkhana and Le Gavroche booked (it’s a big birthday for me, so hang the expense! ), but are also hoping to eat at Duck Soup *and* Duck & Waffle (for the cocktails and the view!). 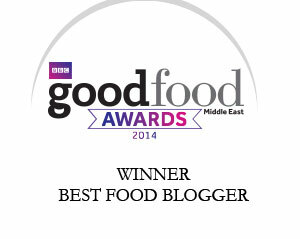 We really like Middle Eastern and North African food so Yalla Yalla and Honey & Co suit us. And Pho is a favourite too. We also like Sichuan Folk in E1 – fabulous and fiery (Although rather expensive for a Chinese meal, imo). I can’t believe someone actually said that there is nothing to eat in London. Baffling. And unadventurous to say the least. Oh! Lastly, The Wolsley for breakfast. Gotta do it once in one’s life – Eggs Benedict Arnold. More to add to my list now Kellie. Oh I envy you Le Gavroche. Happy big birthday – you deserve being spoilt. What an amazing, comprehensive review Sally! Will definitely be returning to this as planning a London weekend soon and haven’t a clue about where to eat – fancy street food from Urvashi’s recommendation of the Real Food Market at South bank and will cross reference other places when I know which 6 year old friendly sights we’re heading for. I think markets and street food can be the key to keeping everyone happy. Enjoy your trip and look forward to hearing all about it. I know – really gobsmacking isn’t it. Even rereading all these recommendations makes me hungry. Gosh – that looks tempting. Wow, Sally! This is a such a comprehensive list that I don’t even know where to start but I’d definitely need at least four stomachs. Sharing this with all my London friends! I spent 10 hours in transit in London (I did manage to grab fish and chips at least) but after reading your post, I will certainly make it a must to go back for more culinary adventures! Thank you so much for this helpful review. I’m going to put a download together so will add it to the list. Thanks for recommending Shu. A really fab list for London. I have eaten in a few of these and absolutely adore The Real Greek. Also one of the first dates my OH took me on was Gordon’s Wine Bar. Ottolenghi’s restaurant Nopi was one of the two best meals we had in the UK. The other was on the Isle of Mull, Scotland! Wow – you travelled far and wide in the British Isles – no wonder it was a blur. I have to have a Pret crayfish sandwich at least once during my visits to UK. A FABULOUS roundup Sally (and contributors!). Bookmarked! I hope it’s not look long before I get to use it on a trip! I am visiting London this April – book marking this post. Love the picture of the Underground restaurant – so theatrical. As is Ms Marmite lover. Kerstin is an original. Have a fantastic time in April. I can’t believe someone wrote that! That is ridiculous! I can’t wait to try out some of your suggestions next time I am in the city. Ah – any tips to add to this list?